Bad News: My ultra fabulous thrift store skirt did not fit. I could get it on and button it up, but my hips bust out from under the pleated waistband and gave me the look of a rainbow striped Elizabethan bar wench. Good News: The skirt only cost a $1.50, so I didn’t mind experimenting. I cut a slit up the side, poked a couple holes in the waistband and slipped through a tension rod. TaDa it’s a cafe curtain. I’m too lazy to hem today, so I just used my sharpest scissors to get a clean edge. As much as I like to sew, I like no-sew projects much more. This took a whopping three minutes. I feel so efficient. Katpawz mentioned a great idea in the comment section: “To cut down on the ravels – before cutting the slits for the curtain rod – place a piece of transparent packing tape over your future cut site and then cut through the tape and the fabric.” Thanks Katpawz, wish I had thought of that! Best part is now I can see my nifty skirt/curtain all the time. It won’t be stuck in the back of a closet 363 days of the year. And, if I ever lose 20 pounds and want to wear it as a skirt, I can just yank out the tension rod, slip the side and be ready to go. Now I’m wondering how many pleated 80’s skirts are floating around the thrift store just begging to be made into cafe curtains? Perfect idea nutbirds! You can also use black lace leggings for that, especially when it has those “runs” already and it can’t be worn. At least it can still be put to good use. Haha, I remember that old Carol Burnett skit! good lord, your mind is just FABULOUS!!!! Literally did a fistpump in my office at reading this. this is what I thought of reading this. It’s like you’ve suddenly diagnosed everything wrong with my windows and I can yell “THAT’S IT!” and fix it. Such a creative idea, I’d have never thought of that! 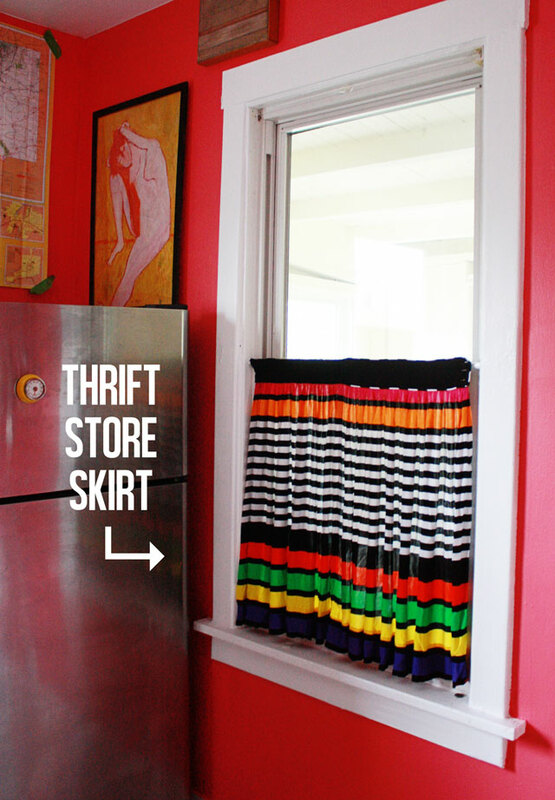 I did this in my livingroom with a DownEast skirt and it was my favorite curtain ever! Mostly because it’s the only completely finished curtain I own LOL…..Thanks for the uplift! I rather like it as a window treatment. Very inventive, Peaches. That is sooo Carol Burnett of you! Gone with the Window Curtains! I love it! If there is a Serendipity Award, you win this week’s for the curtain. If I remember correctly, you told us that the skirt is made of silk; so it might tend to be a bit “ravvely” (ok I made that word up!) 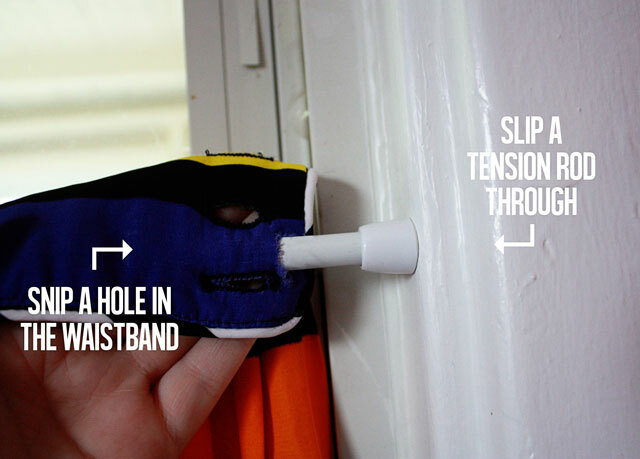 To cut down on the ravels – before cutting the slits for the curtain rod – place a piece of transparent packing tape over your future cut site and then cut through the tape and the fabric. The curtain looks wonderful in your window! Huzzahs to you!! Oh man, is that a great tip! This was a brilliant idea! I love this as a curtain…and now you know I must be on the look out! Thanks so much for showing this idea!!! Love it! Thank you Auntie!!! gosh.. too smart! love love!! I hope you don’t mind that I pinned this on Pinterest (and raved about you in the comment section). I found you, thanks to the sanctimonious Hobby Lobby brouhaha, and I am very glad I did. I can’t wait to start rummaging in my closets–through my own butter-stained and tagged bar wench collection.